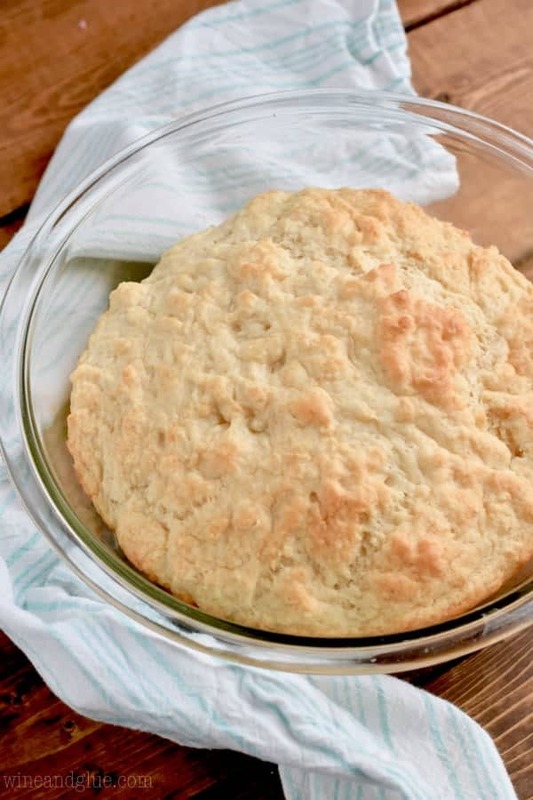 I mean, who wouldn’t want to know how to make a Beer Bread Dip Bowl? Basically the only way you will want to serve dips again! Years and years (and years and years) I had some friends that I would get together with to watch the Bachelor – so long ago in fact that this was back in the day before The Bachlorette. You know, back when they were just counting on the dudes to make the picks ???? 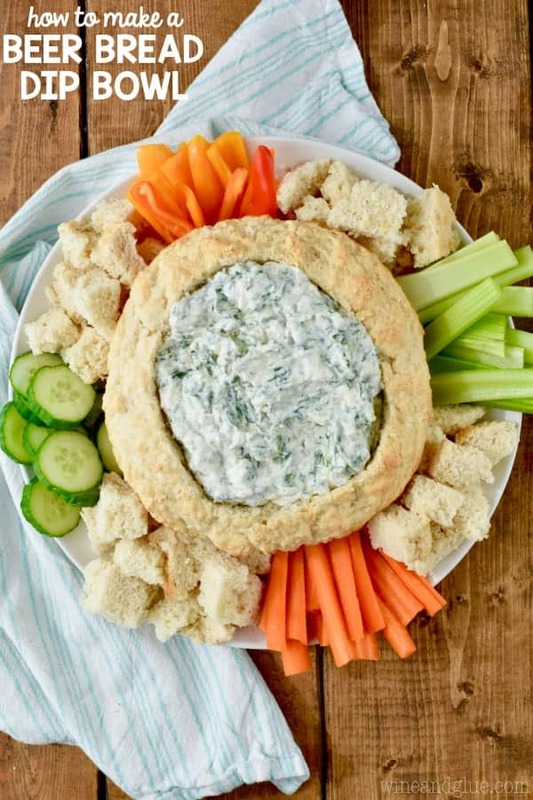 One of my favorite snacks that we would make and eat was Beer Bread and Spinach Dip. You guys. I think I might want my last meal to be beer bread and spinach dip. Is that weird? It is just so flipping good together! I was snarfing down the picture you see above and just willing myself to stop. But I couldn’t because it was so dreamy. So . 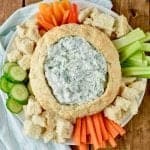 . . a few days ago, I decided that the only thing that would be better than spinach dip and beer bread would be if the bowl holding the spinach dip was beer bread. ???? So here is what we do. 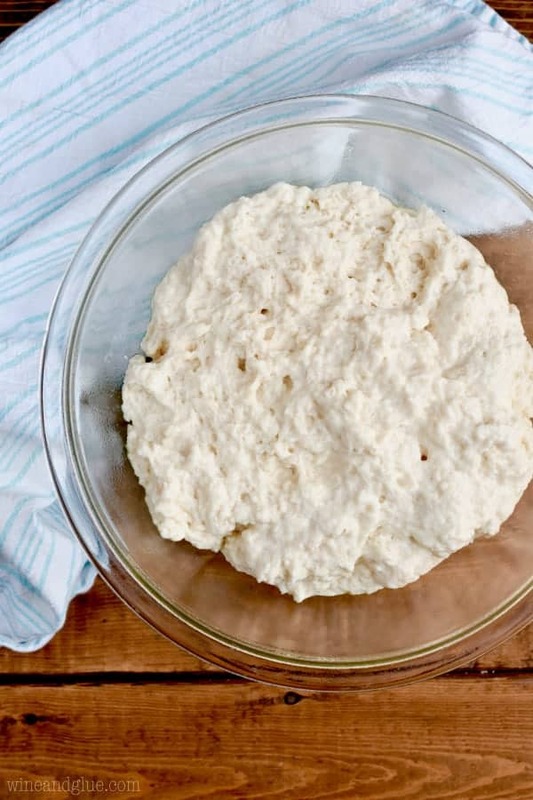 You make the beer bread just the way you normally would (see the recipe below), but you cook it in a glass mixing bowl! I wasn’t completely sure that this would work. But I’ve done it a few times now and it works *perfectly* every time. Look how golden and perfect it cooks up inside that bowl! And here you were clicking over to this post thinking you were going to have to follow all these detailed instructions. You just cook that sucker in a mixing bowl. 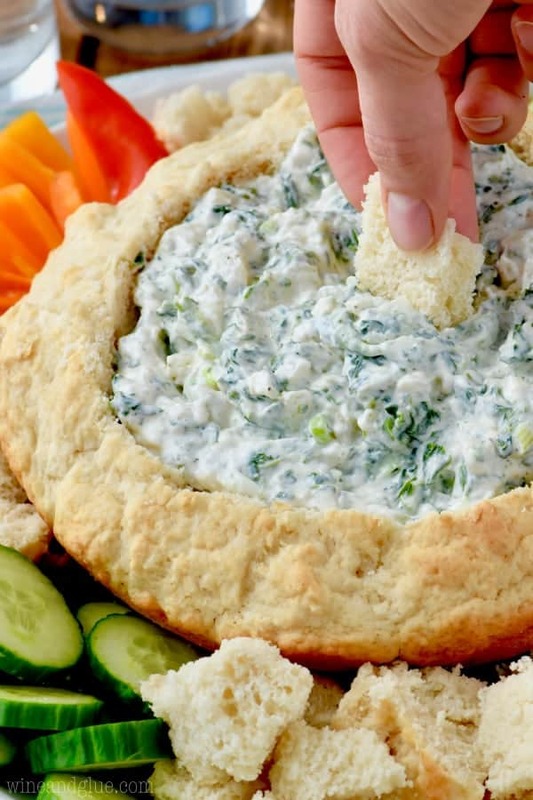 Once the bread is cooked and completely cooled you pop it out of the bowl and then just cut out the middle gently to make room for your spinach dip. Now you can cut up the center of the bowl and use that for dipping. Go ahead and try to cut it all up without eating any of it. Then you make the spinach dip (I have a great recipe that is coming Monday) and add that to your dip bowl. Serve it up with the bread cubes and veggies. The outer part of the bowl totally can be ripped off and used to dip, if your guests are comfortable like that. 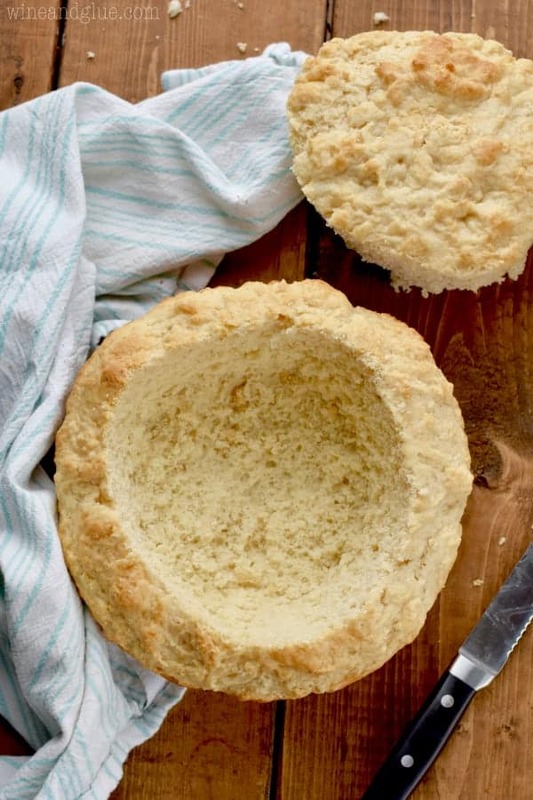 I mean, who wouldn't want to know how to make a Beer Bread Dip Bowl? Basically the only way you will want to serve dips again! Preheat your oven to 350 degrees and remove the upper shelf of the oven, so you can cook the bread on the middle rack. Spray a 2.5L oven proof bowl (I used this pyrex bowl ) with cooking spray and set aside. In a different bowl, mix together the flour and sugar. Mix in the beer until fully combined. Transfer it to the bowl you are baking it in. Bake for 40 minutes or until a toothpick put in the middle of the loaf comes out clean. Allow the bread to cool completely. 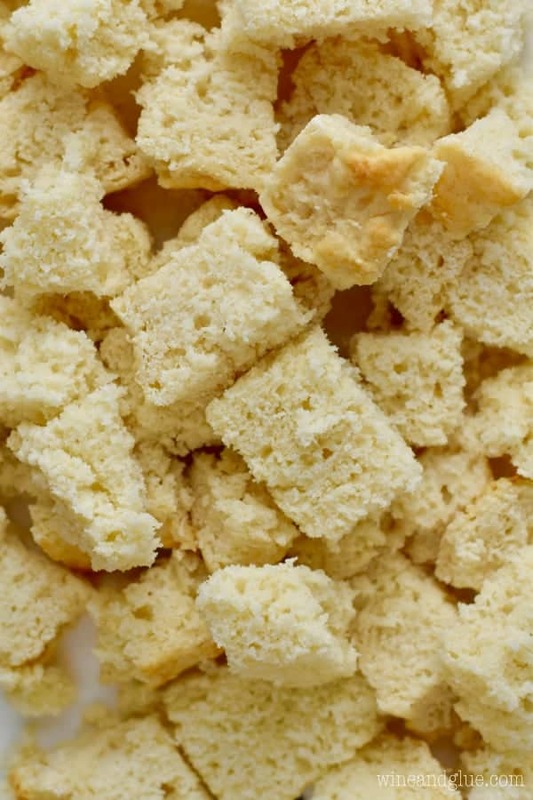 Then cut out the center of the bread (as pictured) cut the center into cubes and serve with the dip. I used Bud Light because it's what I had on hand. I think Pilsners work best, but use what you have. The taste of the beer will be very present in the bread, so make sure it's one you like.